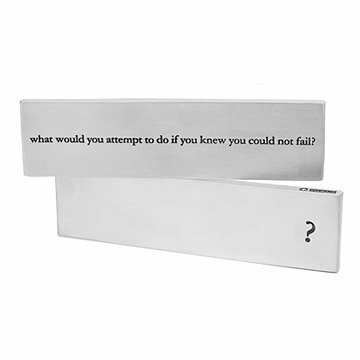 Providing solid motivation, this modern paperweight poses a question that will keep you on your toes. "What would you attempt to do if you knew you could not fail?" This 100% lead-free pewter paperweight poses the question boldly and simply, with an emphatic question mark on the back to keep you thinking. An inspiring reminder to follow your dreams. Made in Vermont. I created a gift box with various items for executives at several businesses. Bought this numerous times, including one for myself! It's simple, classic and clean. I wanted this for myself but I gave it away. When my son opened this, it stopped all the other unwrapping and started a discussion amongst everyone on what they would do if they couldn't fail. Great gift box. Slightly bigger than expected, but not as big as a similar version I got elsewhere a number of years ago (for a lesser price). Thus, it is spendy, but I think it was worth it. This is more than just a paper weight, and has a very powerful question for young people to always have on their minds. When I saw the saying, I instantly said to a close friend, OMG this was made for my older son. I always taught both my children there's no such thing as giving up, or you can't do it, it just isn't possible, I taught them there's always a way to do whatever your dreams are, you just have to work harder if it doesn't work out the 1st time, and if you want it bad enough, keep listening to your heart, and you WILL find a way for all your dreams to come true. Bought as an inspirational gift for an young manager - they loved it! The words were very fitting when trying to find a gift for the entrepreneur business man who has everything. He immediately placed it on his desk as he began pondering his next big venture! I used express shipping and the product was scheduled to deliver on time. UPS however made a mistake when out to deliver but other than that it would have arrived on time. None the less the gift was encouraging and appreciated. I will definitely use this service again when trying to find the perfect gift for that hard to buy for individual. Thank you UG!